West Los Angeles resident and follower of politics signs on to her Prodigy on-line computer account a few times a week to read the discussion of local politics. One day, she clicks her way into a news forum only to find things she wasnt looking for: anti-Latino diatribes, white supremacist dogma and Holocaust revisionist propaganda. One message referred to the Diary of Anne Frank as a Jewish hoax. She clicks off in utter disgust  and reports her find to the Simon Wiesenthal Center. E-mail, discussion groups and news services provide a wide-open communication forum for computer users. Indeed, it is this capacity for free, virtually instantaneous global communication that is perhaps the greatest promise of the Internet. But these services also host those who have enjoyed a license to lie and libel with impunity. The Simon Wiesenthal Center in Los Angeles reported that it has tracked increasing activity by more than 50 hate groups on Prodigy and the Internet. These include anti-Semitic and white supremacist groups such as the West Virginia-based National Alliance. Following a stream of anti-Semitic falsehoods on Prodigy, the Wiesenthal Centers Rabbi Abraham Cooper filed a complaint with the Federal Communications Commission. Hate groups customarily are small outfits, comprised of a few fanatics with an ax to grind against members of particular ethnic or religious groups. A common tactic of hate groups is to disseminate false information to foment hatred among others. Those who operate anonymously on the Internet avoid even the limited scrutiny focused on their brethren in the KKK or the neo-Nazis. They thus thumb their noses at the human, civil and constitutional rights of those they wrong. Jonathan Emord, attorney and author of Freedom, Technology and the First Amendment, noted that for the first time in history, almost every recipient of information has the potential to become a publisher of information, and that people bound by hate and racism are no longer separated by time and distance. Through Internet bulletin boards and newsgroups, a computer user can post any information he likes  and make it available to tens of millions of readers. Microsoft and its chairman, Bill Gates, were recently in court over a proposed settlement with the U.S. Justice Department on antitrust issues. When U.S. District Judge Stanley Sporkin rejected the settlement, anonymous Internet users saw it as an opportunity to start a wave of defamatory postings on Gates and the company, even going so far as to state that the court had foiled alleged efforts by Gates to buy off the Justice Department and the president. I guess golfing partners couldnt even help [Gates], read part of one posting. Another posting anonymously accused the president of being involved in an alleged bag job with Gates, and another falsely claimed that Microsoft was considering acquiring the Roman Catholic Church. In each case, as the postings were anonymous, Microsoft was unable to take action against the defamation. 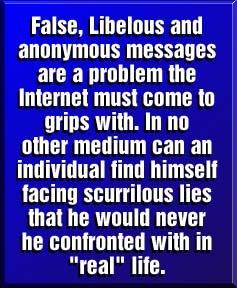 False, libelous and anonymous messages are a problem the Internet must come to grips with. In no other medium can an individual find himself facing scurrilous lies that he would never be confronted with in real life. Remailers and Internet access providers such as Prodigy and America On-Line are waking up to their potential liabilities as conveyors of anonymous libel. For the law to be applied in cyberspace as in the everyday world requires installation of two standard practices: User identification on all communications, or, alternatively, remailers who post anonymous communications knowing who their anonymous users are  and accepting responsibility for the consequences of being, in effect, publishers. This would bring activities on the Internet into alignment with standard practices in other media. In this manner, laws which exist to protect citizens from defamation and discrimination can be applied to the information superhighway.